Trinity’s spirit-wear store, the Titan Closet, is located in the Estes Athletic Center. The Titan Closet stocks a large array of clothing, bags and gifts. Continue to check this web page for new items. Families unable to visit the store during regular and special-event hours may contact the store to place orders by telephone and e-mail. Volunteers interested in staffing the Titan Closet, Café or Lunch Distribution during the week and at special events may contact Wendy Williams via email at wendywilliams@trinityes.org or by telephone 804-327-3149. Trinity silk logo tie. Our price is $29.00. Sold in other bookstores for $65.00. NEW! A bow tie is available in the same fabric for $25. Navy and green striped knit cap ($12.50) and earband ($10.00). Canvas tote by Cape Cod with Trinity logo ribbon, $15.00. Cape Code ribbon belts, two styles (leather buckle or adjustable D-ring), each $21.00. The Titan Closet gladly accepts group, team and club orders. Custom T-shirts are generally under $15.00. Design consultation - free. Large canvas gear bag, $45, comes with special compartments for shoulder pads, mouthguard, phone, and more - (24x13x13). Duffle bag, $30 (20x10x10). Comfy and fun fleece jester hat, $20. For the well-accessorized Trinity student: key holder ($6), lanyard ($5) and bag tag ($3.50). Note cube, $10.00. Great gift! Anklets and crew socks. Great for kids and adults, small medium and large, $8.00. Tervis Tumblers available in 5 sizes: 10 oz. ($15), 12 oz. ($15), 16 oz. ($18), and 24 oz. ($22). All are dishwasher proof! Chill out in your favorite chair with a refreshing beverage. Tuesday, 2:30 p.m. - 4:30 p.m.
Wednesday and Thursday, 12:15 p.m. - 1:30 p.m. In addition to the regular Titan Closet hours, the school store will be open during special events and activities. Special Titan Closet hours are also posted to Trinity's web site calendar. Continue to check here for updates. The Titan Café, Trinity's snack and beverage kiosk, is open daily during lunch. The cafe is located near the Commons in the Academic Building and is staffed by energetic Trinity parents. No sales are transmitted online via this Web site, however, you may telephone or e-mail the Titan Closet to place an order. Orders will be processed within 48 hours. Items purchased will be made available for pickup in the main office located in Morgan Hall unless other specific arrangements have been made. The Titan Closet welcomes alumni orders and orders from outside the Richmond area. Shipping charges will be calculated and added to the cost of the item. When placing a telephone or e-mail order, you may charge the item to VISA, Master Card or your Trinity student account. Payment in advance is appreciated for special order items such as varsity letter jackets. At this time, books are not sold from the Titan Closet. The Trinity Parents Association sponsors a Used Textook Sale in midsummer (late July / early August). A portion of the proceeds goes directly to supporting school needs. If you have questions about the Used Book Sale, visit trinityes.org/usedbooksale. If you have questions about the online bookstore, please contact francisdecker@trinityes.org. 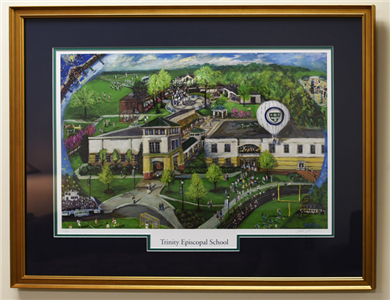 This exuberant, colorful painting of the Trinity campus was presented to Dr. and Mrs. Thomas G. Aycock by the Board of Trustees as a retirement gift. Only 500 signed and numbered limited-edition prints will be available for $40 each.The print is available in the Titan Closet during store hours or contact Wendy Williams wendywilliams@trinityes.org for other arrangements. The print may be mailed for an additional $5.00.